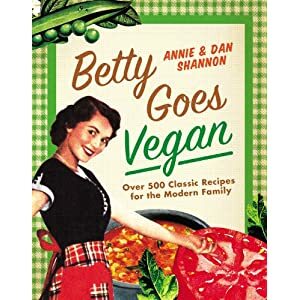 Meet The Shannons: The Betty Crocker Project : Let them eat Pocket Calzones! So a funny thing has happened since I began writing this blog: I started writing letters in my head to random things and people. Perhaps you could say I started thinking in letter form. While I am flattered by your offer of marriage and rather boisterous appreciation of my "cans", I will have to refuse. I do hope though that someday you find the love you are looking for. But I have to say that when it came to these calzones, I only had two words: Yes. Please. I grew up eating Italian food and have always loved calzones. I didn't really grow up in a home with many microwaved things, so I admit I get an evil thrill out of making "pocket" foods. This recipe is actually a bit more like a Sicilian cuddiruni (stuffed pizza) than a traditional calzone, and doesn't have vegan ricotta in it. But isn't that one of the best things about Italian food: it gives you room to be creative? You really can put whatever you want in your calzones and who's going to judge you? If you need vegan ricotta to enjoy a good calzone, we have two recipes for it in our manicotti post that are calzone-tested and -approved. I would also suggest trying Lightlife's Smart Deli Vegan Pepperoni and some broccoli, if you're looking for some suggestions. OK, I've kept you long enough. Are you ready to get your Paisano* on? Preheat oven to 425. If you're using premade dough, follow the instructions on the package. Dust the pizza stone and where you are going to roll out the dough with cornmeal. Cut your dough in half. Roll your dough out into two circles. Move your dough to your pizza stone one at a time. Make the first calzone and then move the other circle of dough over. The second circle will cover first completed calzone, but it is kinda impossible to move a completed uncooked calzone and you can bake two at once if you do it this way. So with your first calzone, spread the Filling ingredients evenly over half of the circle. When you're adding the Fillings, alternate the Daiya into the Fillings so that the Daiya is mixed into the Fillings. Leave a space about 1/3 of an inch around the edge of the side with the Fillings for the crust. Once your Filings are added, very gently fold over the empty side of the dough but not evenly. You want the dough to cover the Fillings but don't line up the edges of the dough. Take the edge of bottom layer of dough and fold it up over the other edge and gently seal it. Put in the oven and bake until golden brown and the top of the calzone makes a little noise if you thump it. Yeah - a good calzone is kinda like a good melon. You'll want to let them cool a little so your Daiya firms up. 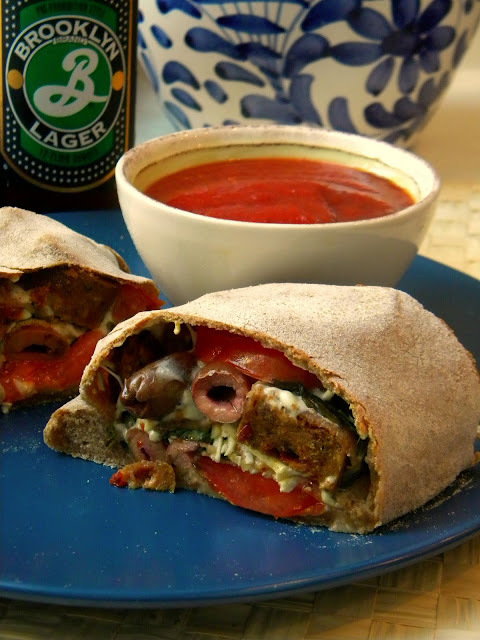 Serve warm with a side of Pizza Sauce to dip your calzone in and something awesome like beer from Brooklyn. * Best Calzone Baking Song EVER! Thank you for showing me this mouthwatering calzone, just a few minutes before my scheduled afternoon snack time (yes, I have scheduled snack time. It makes me better able to face the day.). Now I'm craving real food instead of the dumb soy yogurt I brought to work. Thanks a lot, Annie. Just doing my job Ma'am. PS - I totally wish I had a little Hannah Kaminsky too.